Lately I've let my nails go, or maybe I have the post-baby brittle nails thing going on? I have kind been obsessed with buying different nail polish colors. In fact the other day, while picking out a new color my daughter said, "Mom I think you just bought some nail polish yesterday", which I did. So, when I saw these fingertips it is definitely made me think of going out soon to get a manicure and bringing this as inspiration. 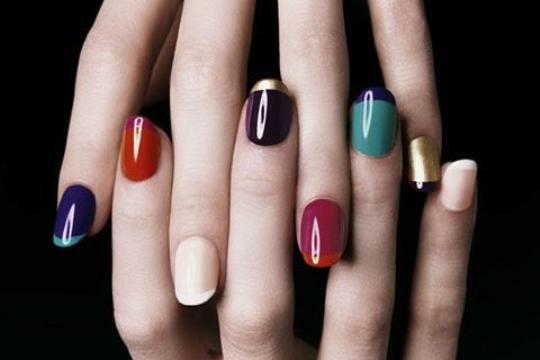 Would you color your nails like this? Heck yes I would! In fact, I might do the same thing and take it in as inspiration. Do you think they'd look at me like I was crazy?! Ya, I def would! I think it's modern and cool. I think nail polish is one of those super cheap trends that you can play with...would love to try the blue/turq combo! I definitely would! The only thing I've tried is black and gold. I'd love to try this with jewel tones! i am all over this. next mani. love. I would absolutely do a manicure like this! But I also dye my hair pink. I'm a nail polish junkie to boot. My fave is Sally Hansen Insta-Dri in Night Flight (black). I know a lot of people are against the black nail polish craze, but if it's kept up and not chippy, it can look very classy (and goes with everything). That's why I like the Insta-Dri. I have terribly brittle/weak nails and this stuff will last me a few days before I have to remove and reapply. I'm going to have to try my hand at a french manicure with an alternate color. :) Thanks for posting! Oh, these are so very very pretty! I would definitely sport this look. Yowie - love these looks and color combos! Hmmm, I'm a biter but if I wasn't these would totally be my nails. Yes! What inspiration...the black and gold, brilliant for all those Christmas parties coming up..with little blackdresses! I could go on..and on...love those fingernails. i used to wear my nails like this all of the time! i would do hot pink with red tips, red with black tips and then black tips rather than the usual white tips. i love seeing all the color ideas together, so lovely! it is inspiring me to actually polish my nails again! i have been in a clear polish rut as of late. love this, though i'm not sure i could pull it off! ooh! very Dru from Buffy the Vampire Slayer!! I loved her french manis: black with white tips, red with black tips (and vice-versa). Such a fun twist on the classic. I remember watching an episode of the UK series Poirot and becoming obsessed with one character's nails - she had them hot pink but with the French-manicure-style edging in deep red with the nail moon done in the same red. I haven't been brave enough to do this yet... But it looks gorgeous! oooo, that is gorgeous. I am loving this and those half moon manicures too. What are you going to do for your wedding???? Yes indeed! And I hear you about the post-baby nails syndrome altough I think the state of my nails has more to do with "tired mommy syndrome". This photo has definitely inspired me to take better care of my nails. I'll be taking this photo to the nail salon for an extra special holiday manicure. I rarely, if ever, paint my fingernails but I am so impressed by these beautiful color combinations! Leave it to Yves Saint Laurent to pull off a manicure that could so easily look garish and all wrong.